We feel blessed that we’ve got some extremely loyal customers who love our traditional values of hospitality coupled with fantastic Turkish food, and as a result we’ve had some fantastic feedback over the years. You can read some of the reviews here. Plus we’re happy to say that food critics love to dine with us, too – see below to read their views on our food and service. If you’ve enjoyed your time with us and would like to leave a review, you can do so here. This is my favourite Turkish restaurant in London and still has not change. My husband and I visit regularly and always enjoy the friendly atmosphere and delicious and generous food. Now this is completed by the very stylish decor and personally loved the choice of colour. It is more specious and much comfortable. With expanded space there is a need of good staff, still new ones were not very attentive and quick. I hate when you ask a waiter for something and he forgets straight after turns his back. Overall still our best place to go. Love Gokyuzu... and the new interior seriously looks amazing. A mesmerising menu, with enough choices to satisfy the most adventurous. Amazingly fresh salads. The tenderest kebabs I've ever tasted. The humus with lamb is our new favourite. Will be back again soon. We are regular visitors to this restaurant and today we arrived to find a new look. It's hard to improve on perfection but they have. The new look is outstanding, chairs comfy, tastefully finished and we'll worth a visit. We are were all very impressed by the toilets! Had a wonderful birthday meal here. The Jumbo platter was big enough for 6 hungry people. We filled up quite a bit on the bread and had lots of leftovers! Staff were friendly and sang happy birthday to us. Top tip: book and ask to be sat in the smaller back room, it's busy, but away from the overall hustle and bustle of the restaurant! The food was amazing (highly recommend yogurt lamp shish ) and Super fast services , Amazing atmosphere..
My first visit was my cousin 50th birthday it was a group of 30, service was excellent even though the restaurant was so full that there was a waiting list for tables .The food was very tasty it was so good that me and my partner had seconds. It was so amazing for the amount of people that was there that l couldn't fault the service at all l felt so sorry for the staff as they worked so hard that day. As a group booking we arrive on time the food was served straight away and the service was so good that we end up leaving just before the restaurant closed we was the last to leave and they didn't even rush us, they even gave all of us a complementarity drink ,even down to them bringing out the cake the staff came over to sing happy birthday to my cousin that was a lovely touch. I have been visiting the restaurant on a monthly basis and even when l have to wait for a table we wait as l see it as its worth the wait for good food and service. I've been many times to Gokyuzu Green Lanes and the Wood Green sister restaurant Gokyuzu & Kervan, with friends and as a couple. Mainly I return for dinner and make sure I have a good appetite beforehand as the portions are quite big. The meat platters are always good for a number of diners to share and I love the beyti as an independent main. The house red wine is also surprisingly yummy. I never leave this restaurant hungry or disappointed and have recommended to all my friends who have since recommended to others that frequently return. The Green lanes restaurant is often very busy on a Friday and Saturday night so I recommend booking to avoid waiting on the list - often people queue outside in the summer whilst waiting up to an hour for a table. And don't forget the Turkish tea and baklava to finish! Gokyuzu was not only great but also really good value. 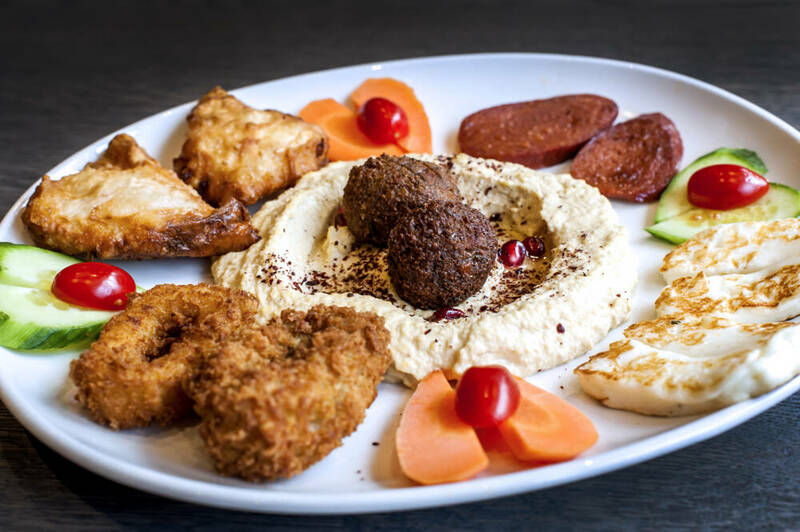 We have been a few times but my two standout dishes are the Mixed Platter and the Sarma Tavuk Beyti. Both come with lots of salad, bread, and dips. Very friendly and accommodating. This restaurant is always packed and buzzing. Great for couples to large groups. We just ordered some lahmacuns (just £1.50 each) for takeaway as we didn't have enough time to sit and eat. They were, freshly made to order and taster amazing. Will return with more time one day soon. The food here was delicious. If you like lamb, you are in for a treat. Portions are good with a lot of variety in the menu. Prices are friendly and the food does the talking. Worth a visit! Green Lanes has a few Turkish restaurants that were all very busy the night we went. We had already committed to going here and the wait seemed to be shorter that some of the others anyway. Very glad we went as the food was delicious and very good value. They start you off with complimentary bread and some Cacik (similar to Greek tzatziki) and a nice little salad dressed with a very lively and fresh dressing which has sumac and pomegranate molasses in it. Great way to start. They were very busy on the night we visited and every seat was full but the service was fast and attentive. We only ordered two main dishes, which was plenty of food for the 3 of us, as the servings are quite generous. We had a Doner, which is some of their tasty grilled chicken with Rice. But my favourite was one of their specialities, Lamb Beyti (minced lamb wrapped in a thin bread and cooked then drizzled with a tomato based sauce. Served with grains (bulgar) and yoghurt. Delicious. The meal including two beers and a glass of wine for about £35. Absolute winner. This is probably the best restaurant I have been to in the last 12 months. Is hugely popular and deservedly so. The quality and taste of the food is simply amazing. Lamb shish kebab was incredibly lean yet perfectly tender - difficult to do as it can dry out so easily. Wonderful breads, fresh salad and dips. This place offers fantastic value for money throughout the extensive menu. 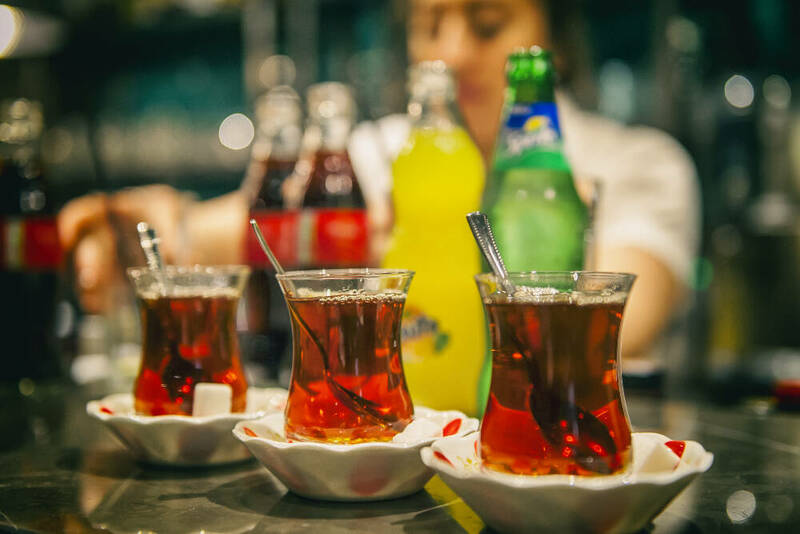 Fully licensed and you are served complimentary Turkish tea at the end of meal. I will be back ... Again and again ! Amazing Turkish food at amazing value. The bulgar is the best in town. We always get mix platter when ever we go to a Turkish place and there mix platter was very good nothing to fault. Good for vegetarians and meat lovers. Great value. Lovely staff and attention. Great share options if you are with a group. Fab place, wonderful atmosphere and great food, highly recommend a visit. Turkish menu to suit all tastes, including vegetarian. Very good value. I went for dinner here with my boyfriend on Saturday night. It was incredibly busy when we arrived and we were lucky to have booked. Waited less than a minute and we were shown to our table. We were given complimentary Turkish bread, dip and salad which all tasted very good. We ordered the small mixed meze and full platter. The food was amazing. The full platter came with rice and bulgar underneath which were flavoured really well with grilled tomatoes and more bread. We had to take the rest home as we only managed to get about half way through. The bill cost £55 and this included a bottle of red wine. The value for money is insane especially considering my boyfriend and I also had lunch with the left overs the next day. Highly recommend this place. We went there for dinner. The restaurant serves the most delicious Turkish food- the portions were fulfilling. Worth for the price! The service was very good, both the waitress and the manager were friendly and efficient. We will definitely come back for the best Turkish cuisine ever and I would highly recommend this restaurant. Delicious!! 4 of us came for dinner last night! Loved all the food. Great, fast service for such a big, busy restaurant. Highly recommend! Lucky us to get Turkish food in a big Turkish neighbourhood in London. This place is bustling and exciting, with waiters running around and calling out to each other. Though they have a menu of many Turkish standards, we were told by friends that our group of 6 would be getting the Large Mixed Meze and Jumbo Platter for £52 total - which was an absolute bargain for a big group! I'd have liked a bit more meze, as they were all delicious (lots of dips, like spinach/yogurt, hummus, dill/feta/yogurt, as well as aubergine in tomato sauce and a bulgar salad - but despite the platter serving 4-5 people, the 6 of us we were all taking teeny tiny portions from it. Admittedly, we wanted to save room for the meat. But I'd say this is appropriate for 3-4 hungry people really. But it was all delicious and at my friend's request, they brought us both regular bread and bread that's apparently brushed with lamb juice or something like that? That was special, but all the bread was lovely. I love Turkish bread! I should say in addition to the mezze they brought us some unexpected freebies like a beetroot and carrot salad and another dip, and I think they gave us something else free the end (maybe Turkish delight? Sounds familiar). The Jumbo Platter is served with rice and bulgur, and is a huge pile of all kinds of meat: Lamb Shish, Chicken Shish, Adana Kebab, Lamb Ribs, Chicken Doner, Lamb Doner, Chicken Wings, Lamb Chops. If it sounds exceptional, it was, both in concept and execution. It is hard to describe the meat feast that took place that evening - we all stuffed ourselves silly and I think we may even have left a bit behind! The lamb ribs were outstanding, and I don't think I'd ever had them before! Lamb chops were also delicious, but all the more standard meats were great too - juicy and flavourful. This is such a fantastic place to get great Turkish food for not much money, big portions, and it's a blast to share it with your friends. Loved the busy atmosphere, was a great way to kick off our Saturday night! 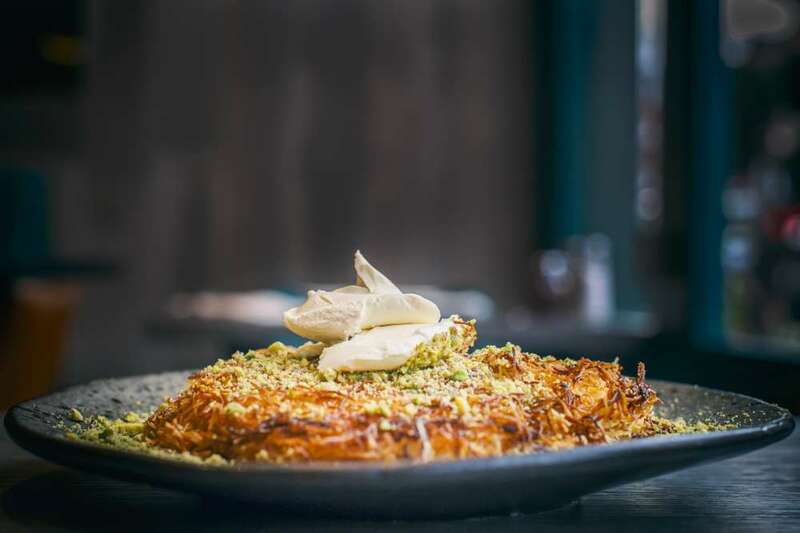 Hands down the best Turkish food money can buy in London - and it won't be much money either! Get anything from the grill if you like meat. If it's your first time and you're with friends, get a platter to share and enjoy some of the most delicious, flavoursome meat you've ever eaten. The staff are lovely, the atmosphere wonderful, the bread and chilli sauce are home-made - and Turkish tea is often thrown in free of charge. Heaven. Hard to please a Turk in the UK with the tailored kebabs for British tastes. Normally she moans it’s not right. So having dined with her and her friend at gokyuzu, and finding her pleased, finally we found a good, no, great, Turkish restaurant, the best chilli and garlic sauce around (that was for me) perfectly cooked food and Ender the manager with his fantastic service ensured we were well looked after ;)) cannot recommend enough if looking for a quality Turkish restaurant with service and price quality to boot. Probably best to reserve a table 😉 you may wait a while as a walk in... And don’t forget to try the amazing baklava nom nom! Five of us went here for supper and ordered the combination meze plate and the combination roast meat plate. The two orders supposedly feed 4-5, but we ate until we were stuffed and still took home enough for another couple of people. It cost 55 pounds for all this food. That's not a typo. So much for quantity. The half-dozen starters were varied and tasty, but it was the meat that stood out: lamb chops, lamb ribs, kofte, chicken in a couple of forms -- all remarkably good. Next time, however (and there will be a next time -- it's well worth the considerable journal to Harringay), I may start with an order of lamb chops. They were exceptional, ranking up there with Tayyab's (q.v.). We had a couple of different Turkish beers, both good. Service was cheerful and attentive, and the food came quickly. Incidentally, it's a good-sized place and full. We were one of two non-Turkish tables, which I take to be a very good Sign. I have been to this restaurant in Harringay before with family but this time we were 10 people and went for an evening meal on Friday. They don’t take bookings and as happened on my previous visit the place was full. We had to wait for about 15 minutes given the size of our party. The wait was well worth it. We ordered mixed grills. Meat was fresh and quality of food excellent. Ambience was good and overall service satisfactory. Only one thing I would say is that the place seemed slightly cramped. However, given the queues of people waiting to get in this was expected. We also ordered buklawas that were fresh and tasted excellent. They provided Turkish tea on the house. All of us ate to our hearts content and the total bill was £15 per head including tips. Overall it was a great experience and will definitely go there again. Have been here 3 times now. Am not a Londoner but for the best Turkish food at Gokyuzu is just spot on! Authentic. Tasty. Every mouthful is just amazing. The service is great too. I am in love with this place and is now definitely one of my favourite places when in London to visit for a great meal! This is such an amazing gem of a restaurant that by writing a review, it may encourage others to visit it. The food is prepared by the finest ingredients, all served simply, the salad is one of the most refreshing I have ate, the bread make in the restaurant, is beyond compare. And the food is out of this world. Simple food, prepared with vast attention to detail, it awesome. The food speaks for itself. Period. No flash, no lights, just the best Turkish food you'll eat in London. This has to be top of the must visit list. The food is fresh and the taste is magnificent. You get salad and bread to enjoy while you main is being prepared, but be careful not to eat too much! We ordered the plater to share between 5 and it was perfect. Can't wait to return. It's the best Turkish food I have ever tasted! The meats are subtly spiced and grilled just enough to be fully cooked yet have that juicy succulent texture. The platter was enough for a hungry family of six. Waiters were friendly and helpful. The place is hard to reach if you don't have a car but it was worth the extra taxi fare! I searched for authentic Turkish food, as delicious as in Istanbul. This is the place. Have been coming here for years. It was a tiny little place with queues out of the door. It's expanded but the queues are still there because the food is excellent. A friend took me here when I visited and whilst I thought the food was incredible it was an odd experience (don’t let that put you off however, it was amazing). There was a group of us and we had booked a table but when we arrived we still had to wait over half an hour for sitting. There does not appear to be much order in the way they sit people. They had a massive queue out the door (apparently there all the time and to me a very good sign) and because of this they just put people wherever. There were even queues within the restaurant once you got past the front door! After finally getting sat down it took a little while to get asked our order but once the food arrived I was in Heaven! Absolutely everything we ate (and we all shared) was unbelievable. Nothing was mediocre and it was all spectacular and I can now see why people queue the way they do and put up with the crazy seating ideas! This was an amazing place to eat and worth the wait! One of the best on Green Lanes , deservedly busy and practically full even at early evening. 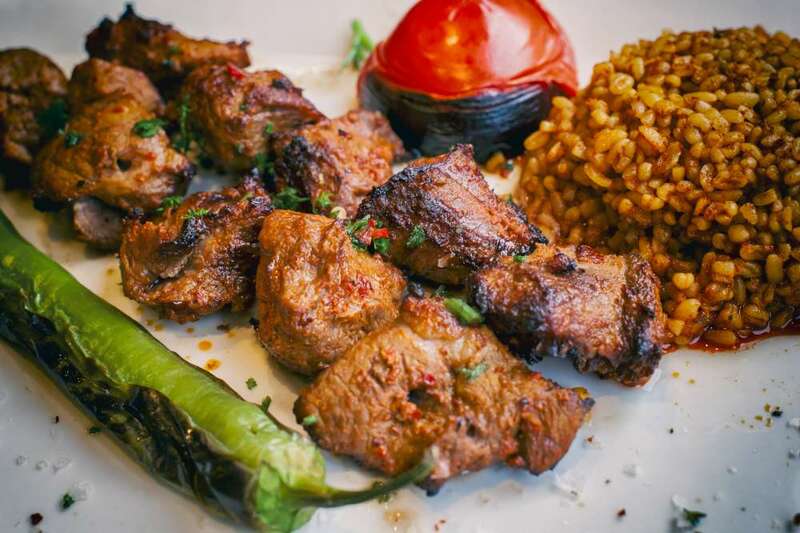 The grilled lamb and chicken is of outstanding taste and quality and served in big portions. The Adana kofte in particular is succulent with just the right balance of spice. The complimentary salad was over dressed to our taste but the bread was delicious. Service was efficient and the noise level sufficiently high to drown out some whining kids nearby. Definitely one to return to. We visited at 8pm on a Saturday night, 6 of us. Glad we pre booked as the restaurant was full which gave it a really nice bustling atmosphere. Service was spot on, food was absolutely stunning, prices for food and drinks are very, very reasonable. Our first visit and we shall 100% be going back. This is probably one of the best Turkish restaurants I've been to. The meat was to tasty and tender! I can't remember the last time I've been to a Turkish restaurant and it's been this good! Even with such a busy environment the service was very good. Would definitely come again and recommend this to my friends and family. Good value for money. Delicious food and plenty of it. Great staff, happy to cater to your taste. Always busy. Will always go back. The restaurant is very nice, and the food is excellent and cheap (portions are very generous). All the meat dishes and salads are great. The place is usually very crowded for dinner, so either you dine early or you'll have to wait a little for a table, but it's definitely worth it! Had a jumbo mixed platter, which was delicious, a great mix of meat and fed 6 of us with some leftover! Quick, friendly service and lovely Turkish tea. We were taken here by my daughter and son-in-law who have just moved into the area. We went on a Thursday night and the place was buzzing the whole evening although in other restaurants round about (including another Turkish one nearby) there were lots of empty tables. We were quickly given pitta bread and the best tzaziki I have ever tasted. Our meal order came very quickly and was delicious. Despite only ordering a starter and a main grill to share between 2/3 people there was so much food that we couldn't finish it - a "doggy bag" then appeared to take away despite us not having asked for it - how civilised! When the bill came (which included 6 beers) we could not believe how cheap our whole meal was. I can't wait to return! There is Turkish and there is Turkish but no not true this one is set out much above others. Good salad just worth without needing to order anything else. The mixed grill is moist surprisingly as usually in most places grilled/barby type food is not so but not here. Their Beti kebab is so diff which is given with an accompaniment also good. Pls let other Learn. My partner and I went there last night with a couple of friends who live in London and highly recommended the place. In a nutshell we loved it. 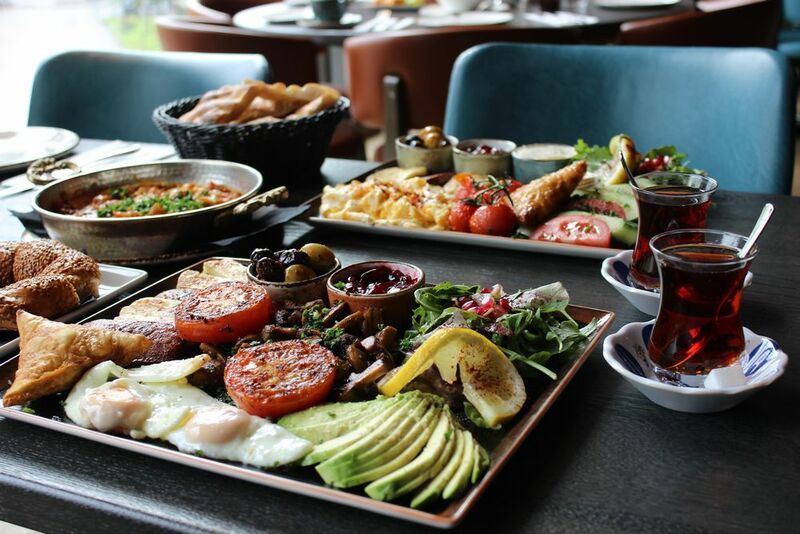 I have never being to Turkey so I cannot comment on the genuineness of the food, but I can vouch for its freshness. Everything was very tasty, well presented and in generous portions. After the complementary bread and salad and a couple of delicious entrees (I recommend the haloumi pizza and the fried eggplants! ), my partner shared a meat place with our friends and I had a vegetarian plate. They were both really appreciated! Staff was helpful and kind and overall we had a very pleasant experience. We'll definitely come back next time we are on this side of the world! Delicious food - everything prepared, cooked, and presented to perfection. A group of friends and I went for dinner and ordered the shared mezze and kebab/shish platters. Everything was delectable. Large portions, and incredible value for money. We weren't able to finish everything and the bill came to £10 each! The service was friendly and attentive, the tables were filled with families and groups of friends. Really relaxing and welcoming. Would highly recommend and look forward to coming back! The consistent reviews rating Gokyuzu as tops for Turkish food drew us here. When we arrived the staff were really friendly and sat us to our table. Moments after we were seated we were immediately served with delicious warm flat bread and a bowl of garlicky tsatsiki and a menu of choices that go on and on... We ordered the mixed grill which was a good value choice. Everything was prepared to perfection, and notably the meat was tender, juicy and flavourful. The high energy in the room created a bustling atmosphere which we thoroughly enjoyed. We would definitely eat here again! Went there again today for my daughter's birthday. As usual lovely people and great service. Loved the food and the service was extremely good. Will definitely visit again. This is probably the best Turkish restaurant that I ever tried before. Portions are huge, appetizers just amazing and the main course is a feast of roast meat of any kind. I suggest you to book tables before going because it gets very busy especially at weekends. We have been going to this restaurant for over 6 years, it's amazing. The people are so generous and the food is delicious every single time. It's our treat of the week! I ordered a platter for my family to share between the four of us, the food was of great quality, grilled selection was delicious, the Mediterranean salad was delightful!!! Overall service was great!!! Would recommend anyone to visit this place, you won't regret it, one of the best Turkish Restaurants around!!! Dare I share my happy secret with you? Yes, let's not be selfish. Gokyuzu has been a favourite of mine for years with its wonderful service, authentic Turkish food and great atmosphere. The price is good too. Please don't crowd my secret place. We eat out a lot... and we come to Gokyuzu regularly since we first discovered this little gem a few years ago. 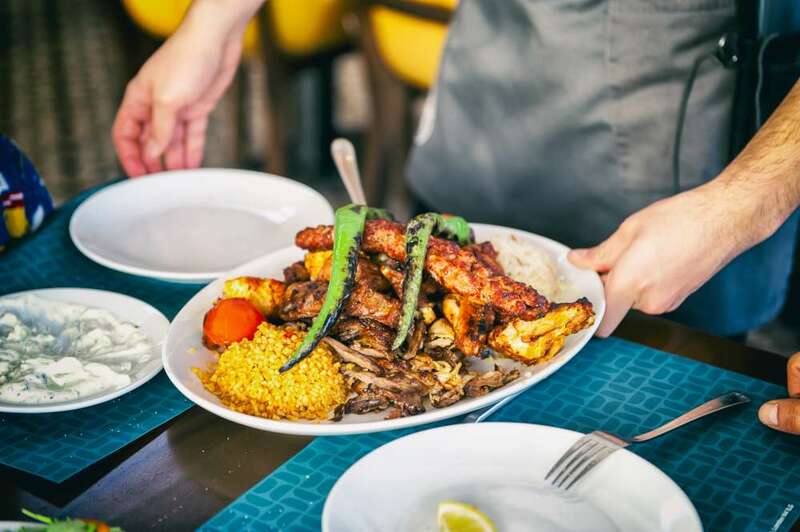 This is probably the best Turkish restaurant in London for flavoursome food, vibrant atmosphere and friendly prompt service. We now visit this place at least 2-3 times month, and it is consistently great value for money. Yes it's busy, yes the waiting staff are super busy and occasionally you wait longer than expected for a table or a drink, but it's busy for a reason GREAT FOOD. The place is a victim of its own success. If you want crap food served at lightning speed I suggest you go to McDonalds and leave this gem to those of us who appreciate quality and value for money! Love this little gem in North London! You never have to wait more than 5 minutes for a table, even on a busy Wednesday afternoon when the line was out of the door! The food is so beautiful and fresh, cooked right in front of you and even the salad and all the bread they give you, you can't leave here on an empty stomach, would definitely recommend! Best Turkish restaurant I have been in London. I visit a lot of Turkish resto but this one is the best. Salad is very nice and food is very tasty. The short manager wearing a shirt and a bit fat is very friendly and good customer service. Big portions, tasty food. One of the best Turkish restaurants in London. Has my seal of approval as a Turk. Great staff as well. Very friendly. Food was very good value for quality and price and short manager very nice 🙂 I would definitely come back...was very busy but we got food straight away...nice discovery! Having assessed health and food in Antigua I was surprised to fly in to London to see a son in Haringey and find a restaurant of this standing. Sure it is simple but the food, service, amount and quality of food plus the low prices are unbeatable. We are talking real healthy home cooked Turkish food and lots of it for so little. When two of you sit down and order a drink you automatically get a wonderful salad , warm bread, and a Cacik a yogurt dish with loads of fresh mint and cucumber free. Then you order a meal or not. I first noticed this restaurant was packed over a few days when I arrived, unlike the others, and wondered why. People were even queuing for take outs. I tried the lamb and rice and thankfully a son turned up as it was all too much lol! Why was it different from the average? I received my glass of house red which was acceptable, a large meal, amazing fresh Greek yogurt ( now don't be insulted you Turkish guys but that is top yogurt lol and the nearest I can equate it to. In fact the yogurt in this restaurant is hard to beat) dip with mint and cucumber ..... Okay then there was the large plate of salad for two and a basket of hot bread included free with the red wine I ordered......... Bazlama is a simple and delicious village bread and these guys make fantastic bread. Almost forgot I went in another time to test them out folks. Yep true to form I got a large plate of taramasalata, plate of real mixed salad for two and yogurt again all for 5 GBP or pounds sterling !!!! Unbelievable for good food and loads of it. Good thing my son was with me again ha ha or I would become a fatty beast! You can in effect have a proper healthy large tasty meal for 2.50 GBP each !!!! !................Go for it, test it out guys, worth it if you love kebabs and all the other homemade healthy Turkish food with fast service and a friendly smile. No instant mixes, rubbish food here. Before I forget everyone, the music is low, the atmosphere good and the people oh so friendly you can't go wrong and very fast. The food is cooked openly on a grill too so you can see what is happening. P.S. I did 3 meals there and they do not know about this write up ! I also lived in Istanbul and worked there. Oh and who am I........ well just another human being, an international worldwide expat gypsy you could say...........in health and a food and drink critic. Jennifer King MBE now in the London UK for a moment in time - Hugs everyone out there. Here's to a healthier world of people. Been here so many times we love it! The food is so delicious and fresh and the place is always packed but the service is never slow. A definite recommendation!! Outstanding Restaurant, food, service just amazing, considering the hordes of people coming through the doors they produce a great feast for everyone. Wrong side of town for me but well worth the drive, definitely returning, just a different class. If you can’t get in due to the masses, tons of other restaurants in the road but cannot qualify if they are anywhere near as good as this place!